Now, you are born again. Join a Bible-believing group of believers to help you learn, through studying the word of God and prayer, how to live and practise your faith. You are blessed in Jesus’ name. May your wisdom double every day so that you continue to teach the wonderful life lessons to your future students. You are not just our teacher, but you are also a close friend who is always there to distinguish for us what’s good and what’s bad. You are a teacher, a friend, a philosopher and a guide. What more can one ask for! We are lucky to have you. Thank u for impacting our lives. You are a blessing. Happy birthday, ma! U r d best! Praaaaise the Lord! May the Lord cause you to excel and be distinguished among your peers in Jesus' name. Amen..Happy birthday, ma'am! You are one of a kind and a blessing to us and to our generation. I bless God for making me know you and I want to use this medium to thank you for all you have done for me... Thank you for shaping and giving my life a meaning... May God bless you richly and give you reasons to smile all the days of your life...Amen...Cheers! Amen. Thank you for these beautiful words, Judith. Glory to God! God will make you a blessing all round too in Jesus' name. Powerful! Amen and amen! May God decorate your life in every way, my dear, in Jesus' name. Happy birthday to my one and only mummy in school here... MA I've learnt a whole lot of things from you especially the habit of smiling a lot and the ability to respond positively when one greets me. MA you are an embodiment of wisdom and I'm happy that you are my teacher and not my lecturer. Today I pray for u... Long life shall you get, your understanding of the word shall be enlightened and your shall continue soaring higher...love you mama and many more years of celebration to come. I'm so blessed by this! May the Lord favour you, Juliet, in Jesus' name. Wow, this is awesome! All praise and glory to God! May God celebrate you, my dear, in Jesus' name. Happy birthday to my lecturer, my mentor and a woman I have being looking up to since my yr one as mother...... Ma, I really appreciate you, I really appreciate knowing you....I can remember the first day I saw you, I didn't even know u are going to be our lecturer, I touched my frnd nd I told her that this lecturer is very beautiful and that day u were not smiling, I really dnt know why....I got amazed the day u came to our class to teach and you were smiling and laughing and I touched my frnd again and I told her, when I said this woman is beautiful I made a mistake, this lecturer is more than beautiful with an amazing smile....I nearly came to your office but I tried coming more than five times but I was scared, lol..... Ma, thank you very much for your kindness, love and care towards us, for always doing everything possible to be lecturing us each time we have you. Ma, I want to thank you for always making us feel comfortable around you with ur smile....Ma, I want to thank you because of this your blog you introduced for us because there are many things that I have read in this blog that have been keeping me going, stronger, happier. Ma, as today marks your birthday, I pray for more yrs to celebrate it, I pray for God's blessings on you cos you deserve and merit it, I pray for God's favour, Gods grace, I pray for God's knowledge and wisdom, I pray that God shall always be your source of inspiration, especially in writing your stories, I pray for unending happiness in your life, as you always use your stories to strengthen me, so shall God strengthen you always. Ma, I pray for good health, I pray for more money in your life, I pray for open doors and breakthrough, I pray that God will never deviate from u, I pray that God will always give you his grace to always stick with him so in the last day, that he shall accept you in heaven, I pray that all your evangelism on earth shall yield a good fruit in heaven..... *HAPPY BIRTHDAY TO A WOMAN OF VIRTUE, MY MENTOR, MUM AND A GREAT TEACHER TO ME* MAY YOU LIVE LONG TO WITNESS MORE OF YOUR BIRTHDAYS, MA! I can't shout oh! This brought tears to my eyes. I pray the Lord to bless everything about you and move you higher than your expectations in Jesus' name. A wonderful prayer and a perfect dedication. May the lord help us to serve him to the end and may his spirit guide us during temptations and trials. Happy birthday 🎂 to a lady with a heart of Gold, a Christ like being and a mother to all. God bless you ma'am. You will live long in Jesus name, Amen!! Amen to that beautiful prayer. May God grant you your desired blessings too in Jesus' name. She is like a Mother, a Teacher, a Blessing, a Gift and above all a Counsellor to me and to all her children, both academically, spiritually and otherwise. I'm sorry i can't find the original words to express my respect for you, but all i pray is that God will continue to strengthen you in your weakness. I know I'm not too close to you but the little i know about you i praise God. Happy bornday Ms Edith Ugochi Ohaja (my lovely lecturer)...wish u all the good things in life and more years to your age. Amen. Amen and amen. Praise the Lord! May God remember you always in your time of need in Jesus' name. Happy birthday Ma, you've really touched lives, mine inclusive, keep being the blessing that you are. God bless you more this year ma. ❤❤💚💜Loads of love from "Big Woman"
Lol! I'm glag you received the big woman declaration! It will manifest more and more in Jesus' name. Amen and amen! Thank you so much and remain blessed! What an inspiring prayer of total submission to God's Will. I give my life to you oh Lord! Do to me as you wish. Re kindle me with your your fire and use me to spread your Gospel. Amen. We all are sinners but the blood of Jesus Christ signalled the era of grace and salvation. His blood has redeemed us. I am a sinner and i repent of my sins today. I surrender to you oh Lord. Thank you ma for this wonderful message of salvation. May you be blessed richly in Jesus name. Amen! Amen. May God uphold you in your journey of faith in Jesus' name. Wow! This is so thoughtful of you, Vivian! May your heart be joyful always in Jesus' name. 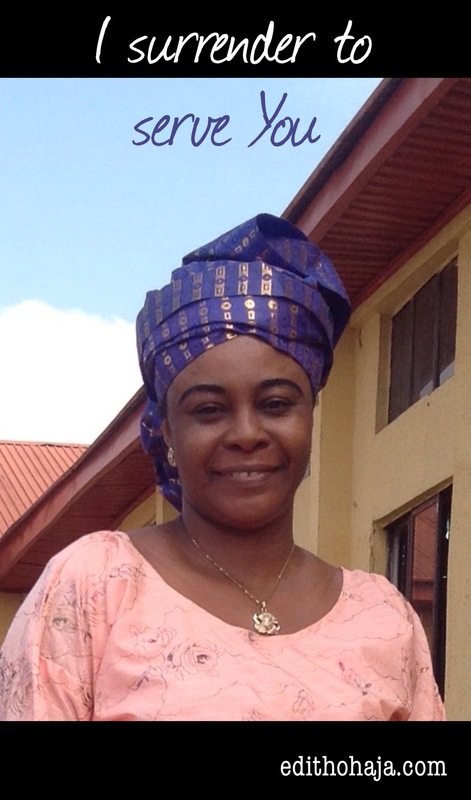 Happy birthday to the most amiable admirable woman She is a mother to all, she is understanding and loving. From my heart, wishing the best in life as you go further in your career and other aspects. Long life and prosperity. May the almighty God guide, protect and provide for you. Amen. Nice poem..... You have always inspired every single part of my life..... I am honoured to have you as a mentor... I pray God protects and guides you in all you do. May God also bless me with that type of smile that is always beaming on your face.. Happy birthday Ma... You're a rare Gem and worthy of celebrating. Glory to God! You are lifted, Godwin, in Jesus' name. Happy birthday ma, wish you long life and prosperity. God's blessings shall follow you all the days of your life. May God continue to strengthen you always in Jesus name Amen. Thank you for your advice, love everything about you. You are a mother, a motivator and an inspirational woman. Thank you and God bless you, ma. God bless you bountifully too in Jesus' name. Thanks a lot, Kat! Shine brightly too, my dear, in Jesus' name. You're indeed blessed MA! How wonderful God is in ur life. May all odds forever be in your very own Favour, Happy birthday Ma! Thank you and may God's countenance smile on you always in Jesus' name. May God bless you and make you surpass your expectations in Jesus' name. Thank you and may you have the same too in Jesus' name. As you begin another year MA, may God protect, keep, bless and strengthen you, may you live in good health of mind and body. May God turn his countenance on you and be gracious unto you. May you always be favoured and may you have reasons to smiile and be grateful to God always.. Happy birthday, MA! Thank you for the lovely prayer. Amen to it in Jesus' name. Ma the peace of God that passes all understanding abide with you always in Jesus' name. really true ma. it's such a lovely poem. may you remain blessed in jesus name. May your wisdom double every day, so that you continue to teach the wonderful life lessons to your future students. You are not just our teacher, but you are also a close friend who is always there to suggest to us what’s good and what’s bad. You are a teacher, a friend, a philosopher and a guide. What more can one ask for! We are lucky to have you as our teacher. Thank you for impacting lives. You are a blessing to our generation, u r d best. May God give u the grace to establish more souls. Happy birthday, ma! Amen in Jesus' name. May God take you higher in Jesus' name. Happy birthday, ma. Your sincere dedication to God, your cordial relationship with your students and other lecturers in the department inspires me. Thank you for impacting in my life in so many ways. Enjoy your day! Happy birthday, ma. Your sincere dedication to God, your cordial relationship to your students and other Lecturers in the department inspires me. Thank you for impacting in my life in so many ways. Enjoy your day. Glory to God! God bless you real.good in Jesus' name. Ring the bells! Aunty Edith adds another year today. Glory to God! my utmost prayer for you today is for God to keep you for a very long time, to reap abundantly, the fruits of your labour. you are unforgettable. a teacher! a mother! a friend!. you are beautiful inside and out, a true child of God and ardent teacher of the word. role model to many, inspiration to all and sundry. i have never seen a more amazing person. your kind heart, your ability to observe, to take notice of minor details, knowing most people's names and even surnames! it amazes me. you amaze me,everyday. always smiling, one would wonder if you have the ability to get angry at all. when i say you are a gift to our generation, I mean every word. may the Lord bless you abundantly ma! I love you!! Wow! This is fantastic, Jennifer. Glory to God! You are a big encouragement to me yourself and I pray that God will use you in higher leadership positions when you leave here in Jesus' name. Happy Birthday Ma and Many more years too. I admire your use of words, i just learnt from your post now the spelling of unction - use to think it was spelt oction. Praise God! And thank you very much. You are lifted in Jesus' name. Shout out to a woman of faith, a mother to all the students who see the beauty she possesses in all her doings, a lecturer with the golden smile, whose teachings are always simplified to the core. Happy birthday, Mama, you are loved by God and by all. God bless you real good, my dear! An epitome of beauty you are, a jewel of inestimable value, the woman with the golden smile, a lecturer with a difference, a mother to all, who is that student that has come in contact with you and wouldn't have anything beautiful to compliment about you, am yet to see that person, you are indeed a woman of God, words of truth will always remain in your tongue Ma, wishing you a happy birthday and many more fruitful and grace filled years to come. Wow, glory to God! I am blessed to have students like you. You will be celebrated by all and sundry too in Jesus' name. Yes oo my father is able to do all things. He has been guiding and protecting us since we were born, may He continue to do it for you ma.Happy Birthday ma. If you're course in the university, I will offer it first. If you are the rain, I will come out of my house to feel it because I know it will wash away my sorrows. If I get provoked and you're the tear in my eyes, I will save it for future purposes. Your smile alone is worth more than thousands folds. God will continue to bless your days, months and years and make them more simple/easy and provide your daily needs and bread. Happy birthday teacher, tutor, Mrs Lecturer, wishing you many more years ahead. All the best for you, MA, for only your articles make me feel happy. Though this is past your birthday, I pray your life be filled with celebrations from now on. And also this poem is wonderful and indeed God sent his son according to John 3:16 to die for our sins and indeed we have salvation through faith in Christ Jesus and the forgiveness of sins. Amen. I am grateful. May God lift you up too in Jesus' name. I bless the name of the Lord for keeping you alive to celebrate another year. Happy birthday ma. May he give you more blessings to count each day and may you be favoured according to his riches in glory. You are indeed a great mother to us all I wish you nothing but the best. oh! am so sorry ma, i never knew it was your birthday. happy belated birthday, ma! As you are stainless, young, beautiful and healthy, so shall you be in the next 100 years of your life... You are an epitome of beauty. Even without makeup, u still look extremely beautiful, more than those who do makeover. I've been wondering the secret but I think I now know. When you are a real believer, you're always radiant and glow like the Angels and that is exactly the way you are. I have decided to be a true believer so that i can shine like Aunty Edith Ohaja. I pray for you with the deepest part of my heart that the good Lord you cling unto will always be your armour and shield all the days of your life. All those who hate you for no reason will see the power of God in you and give their lives to God. You shall be strengthened beyond limit so that you can change lives positively with just a smile. i love you, ma! Once more, happy belated birthday! May God's blessings ,wisdom, mercy and love never depart from you ma. ..happy birthday and God bless you . Quite inspiring! Good for Easter meditation. Christ died for us - for the atonement of our sins. But sadly, many of us have neglected this unquantifiable love of Christ. We have so gone astray that we no longer remember our primary objective to Christ,to God. Hence the need to turn back. The need to go back, and surrender to our creator. He promised to forgive all our sins and make us all as white as snow. If only we believe in HIM. Congrats ma, we wish you successful new age and may God continue to enrich you to the highest dimension and Grant you Divine upliftment so that the world will know how unique and special you are in crafting your writings and I also pray that God will give you Divine wisdom, knowledge and understanding to touch and convert lives. Through your expertise in both oral and writing. The Lord will be your safeguard against any plans of the enemy, they shall not see because the Lord is your shepherd according to Psalm 23 and he will fight those who fight against you according to Psalm 35, the Lord is your shield ma. I pray for long life and everlasting in your life and family. I pray for peace, unity and the divine touch of the holy spirit in your family. Amen. Your posts have been encouraging, helpful, inspiring. May God continue to bless and reward your efforts with success. As you celebrate your birthday, i wish more grace, long life and prosperity ma. His mercies endures forevermore, he is worthy of your praises and even more. I'm happy; he has made it possible for you to see another year of his wonderful manifestation in your life. ma, your impact on people's life has been life changing. The manifestation of God's promises in your life is very great. Thank God for his protection and guidance on you, happy birthday ma. Words can not express how delighted I am, you are a wonderful woman blessed with a charming smile. You are one of a kind, a woman with great moral principles, you are a virtuous woman. You influence everyone you come in contact with positively, you are a great teacher, may God's joy and love never depart from you and your family. You have touched many souls through your teachings, your words of encouragement, your writings, and your evangelism. God bless you Ma. Belated Happy Birthday. Amen!! You're such a great inspiration to us and may God's love, blessings and protection continue to be with you. you are a blessing to humanity ma. everything about you speaks of God's immense love and benevolence. Good day ma ,I know it's coming very late but I understand good leader can not be forgotten easily so therefore I want to use this time to wish you what you wish yourself,more wisdom to help others achieve their goal, more loving heart to love others,more understanding to understand others when they seek for your help,and above all more stories to help others grow stronger,these are the birthday wishes I have for you. He has personally chosen you to change the world through His gift in you. you are a gift to our generation, ma. may He fill your life with His endless grace and wisdom. Wow! Our mother is celebrating, happy birthday ma. Am sorry my wishes are coming late but I believe our Lord's ear is always open to hear and answer prayer. Ma, may the Lord that kept you till this far continue to sustain and guide you. May there be reasons for joy in your life, family, office and beyond. Hope you celebrated well ma. Happy birthday, am coming for my cake. God bless you greatly, ma, for taking out time on your birthday to win people to Christ through this post as it is important to God. God bless and multiply the seeds you sow in people's lives as He has made you a blessing to many lives and continue to enlarge your coast. Happy birthday Aunty Edith may God grant you more life and grease to your elbow . Your stories, poems and prayers have been an inspiration to all and may his amazing grace see you through as you carry the words of sweet knowledge far and wide. I cant stop talking about Gods love and grace in my life,this poem is actually short but it had a powerful effect on me because i have checked my life and its obvious i have to keep serving God and surrender all to him. I wont stop till i know to the end oh lord,Take me and use me to preach your word to the world in Jesus name,Amen. bless u ma. Happy birthday MA, may this good work you have started never come to an end. May his joy continually fill your heart and mind. May God impact in you his wisdom and knowledge Amen... Many more blessed and fulfilled years to come MA.. Happy birthday in arrears ma, the lecturer I can't afford to miss her class.May your days be long ma. *To discharge, by grace, my own dues And fulfill the terms of my calling* This last sentences of yours, should be why anyone on earth should celebrate their birthdays. Knowing why we were sent to earth, and walking in that purpose is worth celebrating itself, on our birthdays. No life is worth celebrating, when purpose has not been defined. God bless ma'am. Thank you. Birthday celebration comes once in a year and it's a time given to us by God to reflect and reevaluate our life. Its pleasing to know that u surrendered ur life to Christ before now.. This is my birthday wishes for you: that u may grow in wisdom and knowledge, love and peace, strength and goodwill from God and the world and above all,long life and graceful aging...... Happy birthday ma cheers. 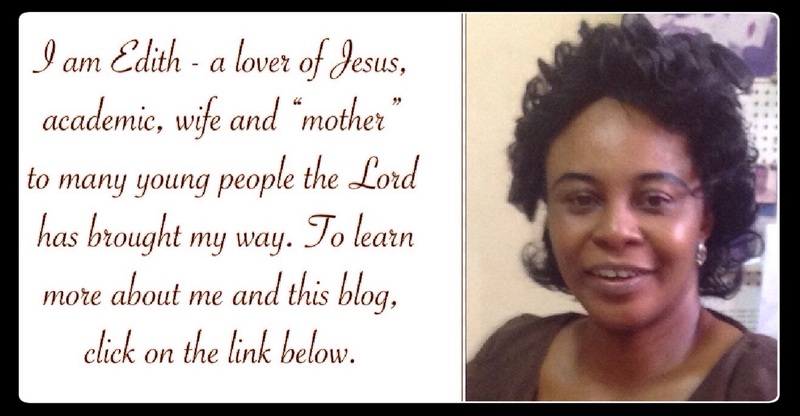 A nice write up ma, may the lord bless you with more wisdom knowledge and understanding, he shall also bless you for sharing his good news to the world especially through your blog, remain blessed ma. O Lord set my heart on fire for you. I want to know you more every day of my life. May every year you add to my life be used to maximize divine purpose. "Fulfilling the terms of my calling on earth" and impacting lives positively. Ma indeed you are worth celebrating everyday because you are not just a mother, teacher, but an instrument to the promotion of the kingdom. You are an inspiration to many. Remain blessed and age with grace and favour amen. As christians,knowing our purpose and reasons of existence here on earth matters alot and working towards it makes us grow deep in his unending love.what a nice write up ma.i feel blessed with these.praying earnestly for the grace to live a fulfill live in Christ jesus amen. Amen! to your prayers Ma. Happy New age Ma. I pray that the good Lord who has made you attain this new age will continue to richly increase you with, direct your daily life, always give you a cause to smile, endow you with a healthy life to continue to witness and celebrate your days on earth. He should feel you with insight and nourish your whole being with blessings so that you will continue to inspire us and be a blessing to us. My birthday prayer for you is to continue growing in Gods wisdom and knowlege. I pray for long life and prosperity. I also pray for Gods love. God's love is just so excess in your life ma'am! Your smiles lightens a heavy-burdened heart and gives life to the spirit-man. Your write-up gives way for creativity, Your inspirational words gives room for total turn around in a man's life, Your motherly love and care brings hope to our generation. Thank you for taking me through the sphere of academics and worldview. God's bountiful love, grace and favour will forever abide with you.. Truly ; You called the Lord and He heard you; He delivered your soul from oppression". A wonderful piece you wrote here ma'am.It is indeed a way of saying I surrender to God my creator. A birthday prayer that fills the soul with so much peace and love, you are epitome of beauty ma, a source of inspiration and encouragement to all. May Gods unending grace,favour and love continue to keep u for us all! I pray today that you not only celebrate more birthdays, but you always exude the true meaning of a role model and a great accomplisher of God's will, who has not only fought the good fight but has won a great deal of souls for God’s great kingdom. You're a rare gem Mummy, keep living His will, never relent, and keep inspiring us all. This post reminds me of a similar post of yours last year, how it all started. You would agree with me when I said it has been the Lord's doing, I can't tell if this is where u wish to be but I certainly believe it is a good foot-start to where u want to be. you've truly inscribed your name in the sands of time. Happy birthday aunt even though it's late already. May you witness God's overwhelming love and care in this new year of yours. Amen. I was passing by and something caught me. . I have something to comend and that is your rhyme.. First stanza used (AaBb) second stanza used (AbAb) thumbs up. It is a great thing to serve the lord.his goodness and mercy endures forever,happy birthday in areas ma,age with grace for the joy of the lord is your strength. Splendid, happy birthday in arrears ma. May the Lord grant you your heart desires. Happy Birthday in arrears ma. The most admirable and God fearing woman,a mother for all, an epitome of beauty and a woman who can smile for Africans.wishing you all the best life can offer and God will continue to strengthen and uplift you in all your endeavours.Amen. Who is like JESUS? Nobody!!!. His love is a 100% . Not partial or with selfish reasons like a Human would love, HE sees me through whatever turbulence I face in my Life, HE IS MY LORD, MY PROVIDER AND FRIEND.. This poem reinstated this affirmation in my life. Oh I missed this on the exact date. Happy belated Birthday ma. More wisdom, grace, prosperity and long life upon your life. Indeed God is faithful to his people. May his blessings on your life never cease. Gud bless ur new age. The lord is really good. Happy birthday in arrears ma. More grace to ur life. More blessings, wisdom and prosperity upon your life. I pray that God will continue to bless you and shower you with his abundant blessings. Amen. God has blessed you with everything ma.Your smile,your wisdom,your beauty. You are a role model to so many people and you touch so many lives positively.May the Almighty God continue to edify and strengthen u in Jesus name. Christ died that we may have life. He died for the attornment of our sins.And as such we expected to turn and surrender to him . leaving our sinful nature and fulfilling our calling here on earth. Knowing abd serving the Lord is the best thing that can happen to anyone,because it gives joy and peace of mind that money can not buy. Ma may you continue to grow in the wisdom and knowledge of christ. Happy birthday in arrears ma. As you have chosen to serve God, may God bless you now and always. Happy birthday in arrears MA, may the Lord be with you,may his blessings, grace, love never seize in your life. May he continue to strengthen you. May the good Lord always give you the strength to continue the good job u are doing in the life of your students.. U are one in a million.. Thank you for always being there for us.. Happy birthday in arrears MA! Ma, my prayer for you is that you will finish strong and follow God till the end. Your labors on earth will not be in vain. You are a blessing. It is a great thing to be born again because even the bible made us to understand that heaven rejoices when a soul is converted.....so brethren, one with God is majority, he does not disappoint if u make him your personal lord and saviour.......accept christ so that you will have life and have it in abundance. tanz for the wonderful post, it really touched me and happy birthday in arrears. Happy birthday mum.Your new age is without sickness and struggles. You are blessed with all spiritual blessings in the heavenly by Christ Jesus. Gods grace is upon you ma. Happy birthday ma. It is obvious that your life is in sync with the plan of God for you. May God continue to be with you and bless you just as you bless everyone around you. Truly He anointed your head with His unction,to daily bring his word to the living because all your posts are always inspiring and draws one close to the Creator.....Happy birthday ma,i pray you keep knowing Him more. Awwwe. .. Soweii it's coming late ... A happy birthday to u ma... Amen to the prayer.. . We need this in our life's daily.. . To reassure our faith in him and and his love in us. .. Happy birthday to u once again. . U are blessed.. .
Yesoo... As children of God, it is our duty to surrender to the lord, who gave us life. Without him, we have know reason for existence. Happy birthday ma, though, it came late, but may God shower his blessings upon you. Wonderful post I have seen you countless times MA and I must confess that your body is reflecting his marvelous works, ride on because you are blessed. You’re an amazing woman, I hope that God keeps you and bless you abundantly, may your joy never cease. Our God is full of wonders, he is great and always ready to help and protect his own. He is a miraculous God! Ma thank you very much, you are very inspiring and you have done a lot in our lives with your posts. Please keep up the good work and may the good Lord bless you. You’re a great lady touching lives, God’s blessings will continue to follow you,Amen. "The person with fortitude is the one who perseveres in doing what his conscience tells him he ought to do. He does not measure the value of a task exclusively by the benefit he derives from it, but rather by the service he renders to others.” St Josémaria Escriva Josemaria Escriva captures an aspect of my lecturer's quality I want to write. She is one who perseveres to what God directs her to do through her conscience.. as such she listens to her conscience as can be seen in her way of doing things. She is such an ever smiling one which I sometimes asks if she must ever had an enemy because she welcomes all with her smiles and this I believe God gave her as a way to draw people near to him. Happy birthday Ma, more blissful years ahead Amen. Happiness depends on ourselves (Socrates), ma you always inspire us to be happy and the Almighty God who sees in spirit will reward you in all the good teaching you are giving to us. Happy womb escape ma. abundant blessings of God in all you do. As you grow in age, I pray that you grow in wisdom and insight too. May all that you desire be granted to you. You are a blessing to me. Am happy I met you. To a great woman that touches the life of youths both socially, spiritually, educationally, and emotionally.....may the Almighty God continue to shower you with his blessing. I pray we all get closer to God, to know him better and enjoy our relationship with him. its inspiring ma, thanks. it is a prayer as well as a poem to praise God. especially for giving somebody another year. in fact, I have copied it out to say on my birthday. the poem is inspiring ma. thanks. Aging comes with new blessing and may the Almighty God continue to shower you with wisdom as you carry on with this wonderful piece of work. Surrendering to the Lord is the best thing for us. The poem is quite inspiring. Nice work here The Lord love, care, guide and will al ways provide for us for he knows our needs. He ever hears, no matter where or when you call on him. So reliable and worthy to be surrendered to. Every single day should be an opportunity to keep praising the good Lord for his mercies. Happy Birthday Ma! More Grace. Happy birthday in arrears MA, indeed knowing Christ is the most beautiful thing that could happen to anyone, there is this special joy and strength you feel......the feeling is overwhelming. May God give you more inspiration to write and his grace shall be sufficient for you always. Happy birthday, ma! Reading this poem fills my heart with so much gladness. We should never wait for a reason to praise God. May our big Daddy continue to shower you with his blessings. This poem is really touching and enlightening. Talking about the immeasurable grace of God in your life from inception to your recent birthday celebration. His unlimited blessings on us cannot be measured, we really owe him our praises and adoration.mma the good lord who gave you the grace to educate us with your write up will see you through amen.. This poem reminds me of Gods unending grace towards us amidst all our short comings he still cares for us.We should never cease praising and thanking him in and out of seasons because we are product of his grace and he deserves all our worship. Thank you ma.May God continue to bless you richly. happy birthday ma let the lord strengthen you in your good work with us. happy birthday to the most amazing personality i know, LET the lord strengthen as you guide us toward the journey of knowing GOD. Happy birthday to the most amazing personality i know let the lord strengthen you as you lead us towards the journey of knowing God. God brought you into this world for a purpose I believe. As you celebrate, your enemies shall be subdued and they shall submit to you. Your write-ups pack creativity, Your inspirational words can trigger a total turnaround in a man's life. Happy belated birthday to our one and only Jackson Mama! Happy birthday ma. You have touched souls including mine. You are really a blessing to a lot of people. This is beautiful ma. God strengthens you to fulfil purpose and live out your dreams and aspirations. Serving Christ, surrendering yourself totally to God is one of the greatest achievements in life. God will always make his servants prosperous. I don't think I can survive without God!, I mean he has done a whole lot, is it forgiveness of sins? Or utmost protection and direction? Or long life??... He really deserves all the glory for without him I'd probably be a nobody. God is love, God is all!! My birthday wish for you is that God strengthens you that u will never relent or be tired of sharing his love... Happy birthday once more!